EVstudio.info has flown past 10,000 hits in only 6 months online and 4,300 of those hits were in November alone as the blog gains momentum. Thanks for visiting and we’ll continue to add more and more valuable information on EVstudio, architecture, Denver, Evergreen, sustainability, construction and a host of related topics. Many of the topics come from our clients, staff and visitors. Please let us know what you’d like more information on and watch the answers appear. 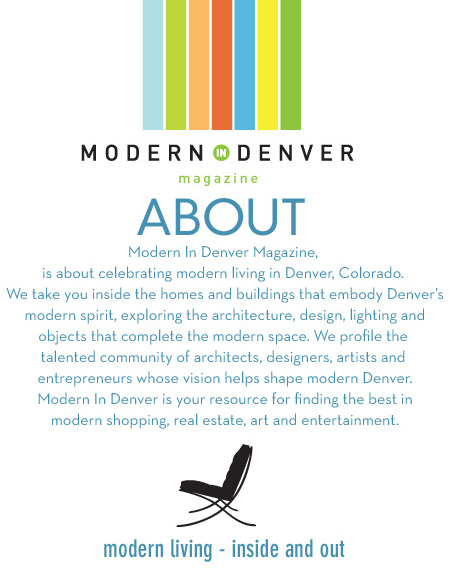 There is a new magazine for modern architecture, design and art in Colorado. Its called Modern in Denver and they are on their second issue and the third is due out in December. You can find the magazine through their website along with The Tattered Cover and several retailers of modern furnishings. Thanks to all of our wonderful clients, consultants and friends who have contributed to EVstudio’s success. Have a Happy Thanksgiving and a great holiday season. BTW, EVstudio is closed for Thankgiving and the day after, back to work next week. The International Residential Code specifies how garages must be separated from dwelling units in residential construction. There are rules for openings (doors), for penetrations and for gypsum board in the wall assemblies. First, you cannot have a door directly from a garage into a room used for sleeping. Where you are allowed to have doors leading from the garage into the dwelling unit the doors need to be solid wood a minimum of 1-3/8″ thick, solid or honeycomb steel a minimum of 1-3/8″ thick, or have a 20 minute rating. Where you have ductwork running from the house through the garage it needs to be a minimum of 25 gage steel and there can’t be any openings into the garage. All penetrations through a rating need to be properly fire rated. The garage needs to be separated from the unit by a minimum of 1/2″ gypsum board applied to the inside of the garage and that goes to 5/8″ gypsum board where the garage is below the rooms. You also need to protect any structure in the garage that is supporting the dwelling with 1/2″ gypsum board. Generally speaking we specify 5/8″ everywhere to avoid confusion on the distinction between different conditions. On a detached garage, the garage wall needs to be protected where the structure is within 3′ of the dwelling unit. It wasn’t exactly the warmest day for a PV installation, but better to get the panels up before the snow really starts falling! 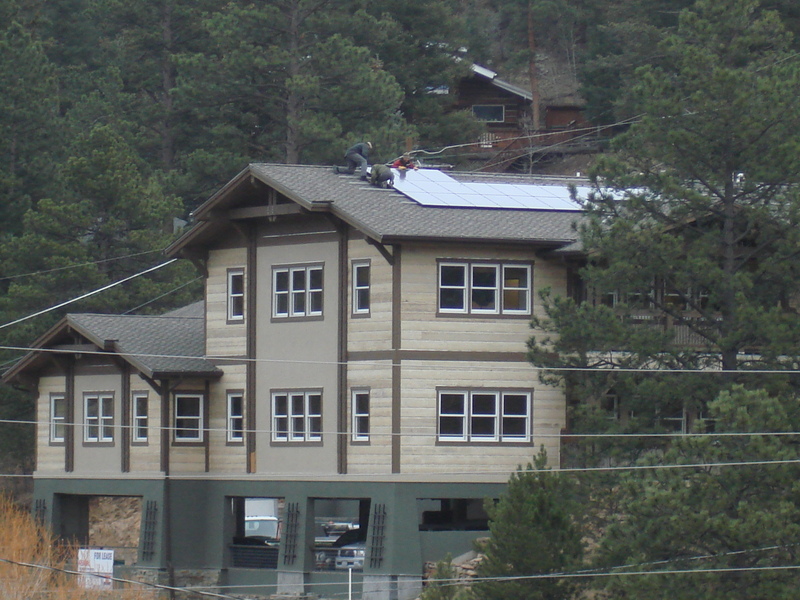 The Evergreen Terraces office building is getting the final touches put on for its photovoltaic array. The system was installed by Standard Renewable Energy and is an integral component of our LEED silver design goals. The system will have an integrated display in the lobby of the building, providing a visible display of the actual energy creation in realtime. More on that when the installation is complete. The Current EVstudio Architecture Portfolio is now online. Please click the image or link and check it out. I’ve been working on a number of Autodesk Revit Architecture renderings, and am coming to find that with the right combination of settings, you can get reasonably good output in relatively little time. 1.) Make sure that you’re running Revit with more memory than the minimum requirements. In today’s computing world, RAM is king and the more the better. If you find things stalling out or taking a lot of time to accomplish, chances are that your memory is being overtaxed. A minor investment can go a long way for your sanity. 2.) Select the right resolution for the job. In my experience, the difference between medium and high is nearly imperceptible, but the difference in time is significant. Unless you’re doing large format presentation boards that will be looked at very closely, you can get reasonable quality for e-mailed .jpgs in a fraction of the time. Also, be careful about the region you choose to render. Click the region box in the render screen and adjust it so you don’t go rendering everything under the sun, but rather, only what you really need. 3.) Render views that are set up with a camera perspective. Use the camera tool from the view pull-down menu and play around with the settings. These views will always be more realistic than an isometric view from the basic 3D view. Once you dial in the right view, you can save it and return to it later. Also important to note that the sky background only renders in the perspective views and not in the basic 3D view. 4.) Save your renderings to the project. For a long time, I exported the views from the rendering navigator to .jpg. It is much more useful to save these in the project and name them the same as the views so that you can flip through them at any time. 5.) Run draft renderings before your final rendering. This one seems so basic, but it’s easy to take for granted. You may think you have everything dialed in so you go ahead and run the rendering and leave for lunch only to come back and find out that your sun settings were set for morning when you wanted afternoon. Unless you take two lunches that day, you’ll be waiting for that second rendering. Select the draft resolution and spend a minute making sure things are coming out right before you commit to the long render. You can also render a small region of the image first to make sure materials look right before the full render as well. 6.) Populate the image with real life objects. Things like furniture, plants, a grassy site, a car and the occasional person will go very far to make the rendering more life like. While I haven’t been able to achive highly photo-real renderings from Revit (primarily because I don’t have the time or experience to model the building at a level of detail that warrants it), these objects help to animate the image and a lot of the objects (even out of the box) are modeled with a high degree of quality. 7.) Spend time tweaking the exterior materials. Some of the basic materials from the software out of the box simply don’t render very well while others do. I have yet to see brushed metal on a flat surface really turn out as I expect. However, in the materials editor, there is a continuum of choices to explore and once you get it to look right, lock it in and put it in your template for future projects. 8.) Consider Revit 64. To be perfectly honest, I don’t know much about this one, but I understand that 64 bit version of Revit will be available to subscription users very soon. Rumor has it that 64 bit rendering runs significantly faster and smoother. Graphics gurus can speak volumes about this more than I, but with a basic understanding, 64 bit has got to be better than 32 bit no matter how you slice it. 9.) Be aware of the lighting scheme that you’re using. This is a big enough topic to warrant it’s own entire post (if not a book), but at the basic level, try to be realistic. Set the drawing up so you can control where north is and for exterior renderings, select edit/new under the sun dialogue box and you can dial in your date, time and place. This will give you an accurate account of a solar study and make your rendering all the more realistic. Artificial lighting is more relevant for night-time or interior renderings, but you will have to place that lighting in the model and I daresay, that will be a fairly advanced model than the basics we’re discussing here. 10.) Be realistic about your expectations. If you have need for serious rendering horsepower, Revit is probably not your best tool. other programs like 3D Studio are much better suited for true rendering and ease of use. We’ve had great success building the model to a practical level of detail necessary for the construction drawings, and then running the photoreal renderings through another platform. It depends on the purpose of the rendering and at what point in the design proces the rendering takes place. You can get great things from Revit, but if you expect the world, you may be dissapointed. This list is in no particular order, and I encourage Revit users to share their experiences with us. You are currently browsing the EVstudio Architecture, Engineering & Planning | Blog | Denver & Evergreen | Colorado & Texas Architect blog archives for November, 2008.